My name is Erik I am from Pittsburgh, PA. I started on opiates for doctors orders which was “ok” i guess at first but then before i knew it became an obsession with every drug in the book. Now, understand I’m only 21, so I was abusing drugs(mainly opiates) since I was 14. It was all I thought I needed do to be happy! I got so comfortable I started going to a methadone clinic at 20 and stayed on 130 mgs for one whole year. I just was not content though because I could never get a enough. At about this point I FINALLY realized i would never get off methadone and my life would be driving 13 miles everyday to feel just NORMAL not high NORMAL. That was the scariest most trapped feeling I have ever felt. So I went online looking for a detox center. NO ONE would take me beacause of the withdrawal symptoms ahead of me. 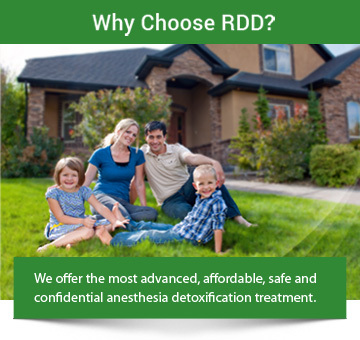 Then out of a miracle i found Rapid Drug Detox (RDD) a place i simply typed RDD on Google and found. They told me they have detoxed people from every single opiate in the book and especially methadone. They actually did up to a 800 mgs detox of methadone before now, that is amazing. Now here is the thing, I stayed in a beautiful hotel, was detoxed off methadone 130 mgs in one hour. When I awoke from the anesthesia, I felt like a new man and anyone who feels stuck please, for yourself do this program. When you are ready! It SAVED MY LIFEEEE. It will save yours. It’s been a week since the procedure and imp on a few medications the doctors gave me, but I feel like a entire new person. “JUST DO IT”. Don’t let drugs ruin YOU! This is my testimony I want to thank everyone from RDD for saving my life. There is no money or possesions in the world that could match what you have done for me. I LOVE YOU GUYS!!!!!!!!!!!!!!!!!!!!!!!!!!!!!!!!!!!!!!!!!!!!!! !